I look for land characteristics that will suggest what the area’s deer are likely to be doing. 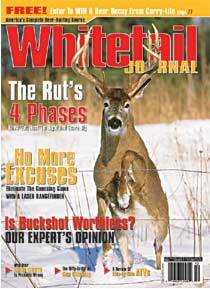 I cover a lot of ground in my whitetail excursions, and consequently I like to start my scouting forays by reviewing the whitetail record book map compiled by the Quality Deer Management Association (QDMA). This map ranks each county in the U.S. for the number of Boone and Crockett (B&C) and Pope and Young (P&Y) whitetails registered. Lately, I’ve focused on the top counties. After I’ve identified the county I want to scout, I get a plat book for that county. A plat book is a tool vastly underutilized by hunters, I feel. Plat books precisely map ownership of all land in a county. It helps a hunter contact landowners, but more so for my purposes, it identifies public lands that other hunters might not know about. For me, there’s nothing that beats having my own private public land! I highlight properties on the plat map I want to check further, then find them on the appropriate topo map (usually the large-scale ones like those found in the atlases published by DeLorme). 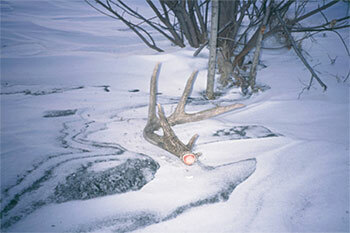 I look for land characteristics that will suggest what the area’s deer are likely to be doing. Topographical features such as ridges and ravines, woods, fields, swamps and strips of cover tell me where deer likely feed, bed and travel. When I’ve got plenty of marked-up maps and places I want to check, it’s time to hit the woods. I usually start by driving around big blocks that encompass the land I hope to hunt. This gives me the “big picture” in terms of remote feeding and escape areas for deer, surrounding landowners and influences they might exert and, most importantly, accesses for me and possibly competing hunters. I also take a close look at cover in the area and surrounding land and determine if it is suitable for bedding, escape or travel cover. My reconnaissance missions in the Midwest began around mid- to late February, by which time most all the bucks should have dropped their antlers. To me, hunting for shed antlers is more recreation than work. You don’t know what you might find, and the anticipation one feels after discovering the shed of a huge buck lasts through the spring and summer. Naturally, the best places to look for sheds are areas where bucks concentrate during that time of year: feeding, bedding and travel areas. If I find a large shed antler, and determine that it’s in a spot that the deer is likely to use in the autumn, too, you’d better believe I’ve located my hunting spot! To scout efficiently, you should be looking for several things at once. You’re looking for sheds, sure, but you’re also looking at current travel sign, trying to determine if it’s likely to match travel concentrations in the fall. I find it usually does, though there are changing factors— especially with regard to food sources — that can alter that. You’re also looking for last fall’s buck sign. 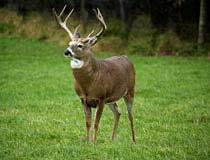 Last fall’s rubs and scrapes should still be quite obvious and their location will help you discern probable patterns for pre-rut and peak-rut activity. Pay particular attention to rub lines, as they are often used perennially. Pull out those maps again. Start plotting your findings on the maps — rub lines, concentrations of scrapes, trails, crossings and food sources. Mark some probable stand sites. If a good-looking stand site jumps out at you, you can get started right away preparing it. Trim out some shooting lanes; open a “shootable trail” and obstruct surrounding trails to funnel deer past you. Clear the way for your access route to the stand. If you’ve done your off-season homework well, all you need to do is show up and hunt next fall. And when that big buck comes sauntering down the trail opening evening, you’ll be glad you did.